Don’t miss it! 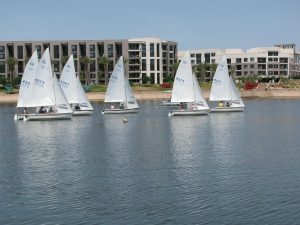 A full day of sailing activities at Tempe Town Lake!! 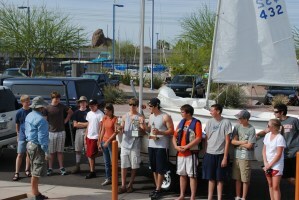 The day begins with AZ High School Sailing Championships from 10am-4pm. Click on the RACING PAGE for NOR, SI and Sign up forms. 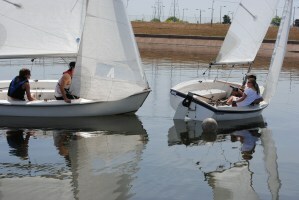 The final ON THE WATER session of Spring ASF Start Sailing Right runs from 1pm to 4pm. 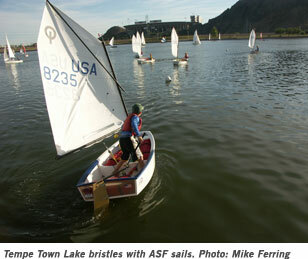 And then ASF hosts a Spring Sailing Picnic on the “grassy knoll” from 4pm-7pm. Bring your lawn chairs! Bring your boat! 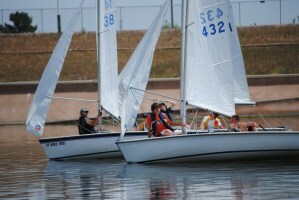 Or launch one of the AYC Sunfish or Lasers. To RSVP and for more information contact John Mayall (480 290 8510) or Emory Heisler (602 679 0462). A great weekend of racing at Lake Pleasant. 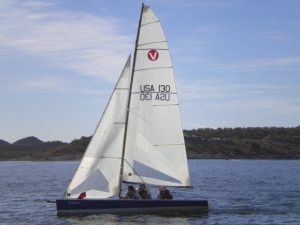 From gusts that knocked a couple of boats over to ghosting along, wind shifts that had us sailing all over the lake and at one time boats under spinnaker heading at each other, from different ends of the lake. Lake Pleasant at it’s best/worst. A great dinner from the Catalina 22 Fleet. Good times! Click here for scores. 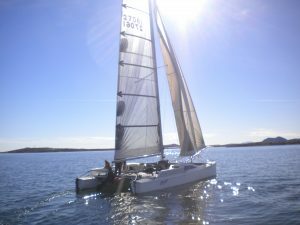 Anyone see this on Sailing World? Good luck to the AZ Buccaneers as they compete in the NOODs and their Western Region Championship! 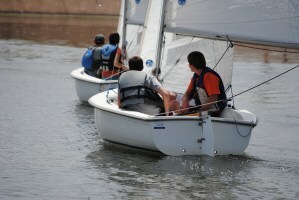 This year’s High School Sailing Championship will be held 16 April 2011 at Tempe Town Lake. Click on the RACING PAGE for NOR, SI and Sign up forms. …and the winners are – POSTED HERE! Lake Pleasant Scores are up. What a 180 degree different weekend the the last race weekend. Warm, sunny, light wind, instead of the cold, rainy, blowing the dogs off the chains of the previous week. 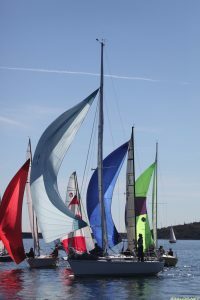 Wild weekend, too wild for safe sailing on Saturday, but the results are posted, and many comments have been shared about the great RC work even NOT racing Saturday. Could we have sailed? Here are some of the comments about the wisdom of not sailing, and a great video of what it could have been like! Dave & Wendy: The RC was on station with a course set in winds that the National Weather Service reported 10-15 with gusts to 37. 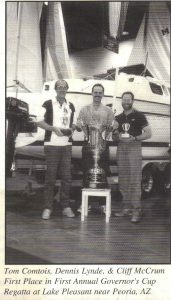 We motored out in the rain in our J/24 along with 4 Merit 25’s; Dream on, Circuitous, Hydropathy & Sea Dreams. The Merits had all set their main sails and we were just about to when Craig called to belay that and look upwind at the gust that was coming. We hung on as the wind hit and heeled the boat over and for the first time I saw water being pushed up the side of the hull to stream up along the lifeline stanchions and then blow across the deck. We decided that was it and headed back to the ramp. We saw 2 of the Merits with ripped mains. All made it back in safely. A BIG thanks to the RC today for going out and a BIG round of applause to the runabout drivers! RC/Ferring: Thanks Dave & Wendy. I think we were all a little nuts for being out there under the conditions, but fortunately nobody was hurt. 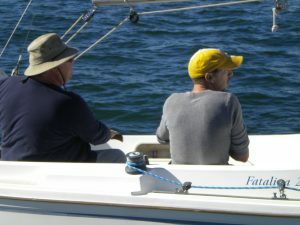 Greg Woodcock and Youri Lenets were the runabout crew, who appreciated a powerful bilge pump to evacuate the waves crashing across the bow. Our thanks also to George Campbell and Joanne who were great on the RC boat in heavy wind and rain and heavier anchor rode. John Hiett: Well given the brutal brunt of a boundless breeze blasting boom…there are old sailors and there are bold sailors, but there are no old & bold sailors. Pat Byrnes: Better to be a chicken than an insane fried chicken that was not bold enough to be a chicken to begin with. Mike Ferring: This is a precedent-setting string! 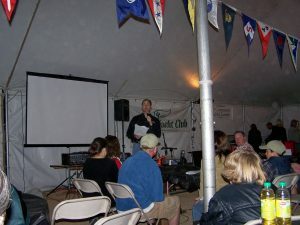 A few days ago I was chipping in with information on brats and beer and the banal business of sailing classes. Now look. You’ve elevated it to the sturm and drang of man’s existence! Risk, reward, danger, thrills, and bronco-riding, storm-thrashed skiffs. I’m Googling Proust quotes now. 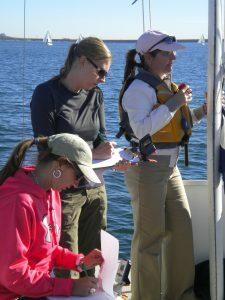 Editor: Now we know what some of our sailing compatriots are up to when they are NOT on the water. 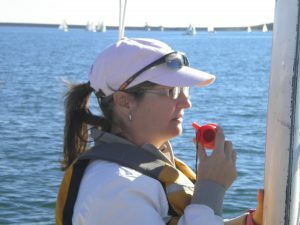 That, or maybe it’s just that philosophy is one of the gifts received from time well spent in the wind and on the water! …ARE POSTED! Check them out and see who was there and who was square! CLICK HERE! 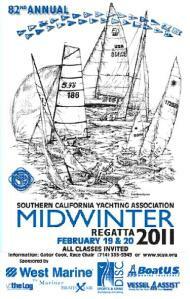 Every registrant gets a sail-cloth regatta document portfolio AND a chance to win SCYA Midwinter HARDWARE! Backpacks actually! Here they are…now get out there and Sail FAST (er)! 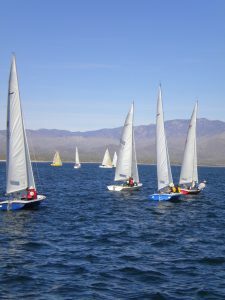 Spring Racing at Lake Pleasant, that is. Have you registered yet? There are 33 boats signed up as of 7pm Thursday. Spins are on RC, which could mean a good dinner. Could. We’ve had a couple of folks submit photos via the Photos Upload Link. Here they are along with a few of my own added. 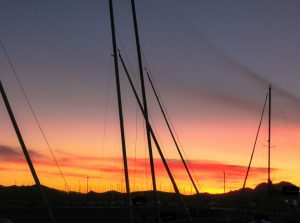 Also, don’t forget to visit our visiting Professional’s Site – www.SailLog.net – for some really great pics!